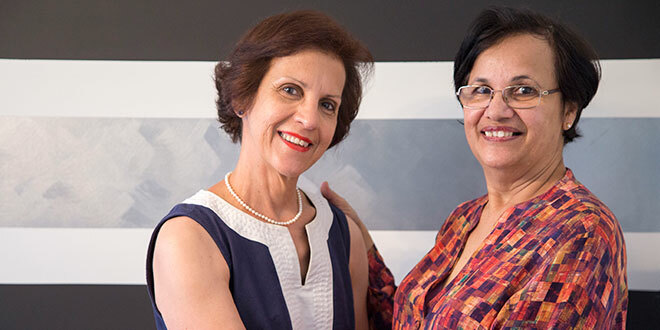 Honoured: Helen Mahoney (left) with Indo-Australian Association vice-president Dr Eugenie Pinto. ORDER of Australia recipient Helen Mahoney has been honoured for “tugging on the conscience” of Indians and Australians through her work supporting a rehabilitation centre for children with disabilities. The Indo-Australian Association, based in Chennai, India, has honoured Mrs Mahoney with a meritorious service award for her work with Friends of Mithra, a charity that provides financial support for a rehabilitation facility started by her aunt, Australian nun Sr Mary Theodore. Sr Mary Theodore was an early recipient of the award, which honours an Australian or Indian person who has brought both countries together through various causes. Mrs Mahoney joins at least eight other Australians honoured by the IAA, including cricket legend Dennis Lillee, and Gladys Staines, the widow of murdered Christian missionary Graham Staines. Mrs Mahoney said she was “stunned” to receive recognition from people of Australia and India. “I was absolutely bowled over,” she said. Sr Mary Theodore started Mithra, or Madras Institute to Habilitate Retarded, Afflicted, in 1977 with initial support from her Australian family, including her niece Mrs Mahoney. 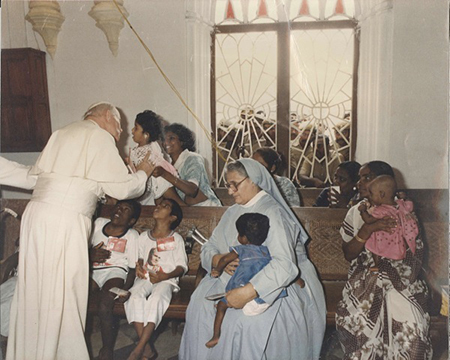 The centre received a visit from St Pope John Paul II and is under the care of the Congregation of the Sisters, Servants of Our Lady of Sorrows, originally from Kerala. When Sr Mary Theodore died in 2012, Mrs Mahoney promised to continue her aunt’s legacy and ensured a future for the children receiving care in Mithra by starting an Australian charity. After less than a year of operating as a registered charity, Friends of Mithra has already raised more than $145,000 for its first project – rebuilding a girls’ dormitory, which was flooded out in a devastating 2015 monsoon. IAA vice-president Dr Eugenie Pinto told The Catholic Leader Mrs Mahoney was chosen as an award recipient because of her efforts to bring India and Australia together through children with disabilities. Dr Pinto said Sr Mary Theodore and her work at Mithra was familiar to the IAA, and that several members attended her funeral in 2012. However the family connection was not the primary reason for Mrs Mahoney’s recognition. “The fact that we chose Helen was not just because she was the niece of Sr Mary Theodore – Sr Mary Theodore has many nieces and nephews – but there was one outstanding one who knew that her heart lay with this aunt and if her aunt passed on, she had to carry this wonderful legacy,” Dr Pinto said. “She could have easily said this is not my concern, but she took it up and Mithra is flourishing today, being so self-supportive. “Children are learning to make a life for themselves which would not have been possible earlier. Friends of Mithra members including Mrs Mahoney and Christian Brother Rob Callen also lead pilgrimages and immersions to Mithra for thousands of Catholic school students across Australia. “The children at Mithra just love it when the Australian students come because they come uninhibited,” Mrs Mahoney said. She said the immersions facilitated a “change of heart and change of soul” in Australian students. “We often say boys go over and men come back,” she said. Mrs Mahoney will receive the award at a ceremony in Chennai on February 23.